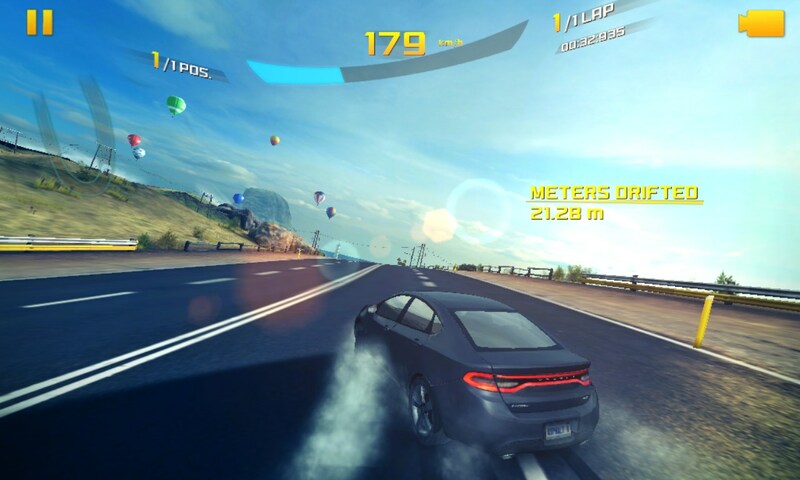 Asphalt 8: Airborne – Games for Windows Phone 2018 – Free download. 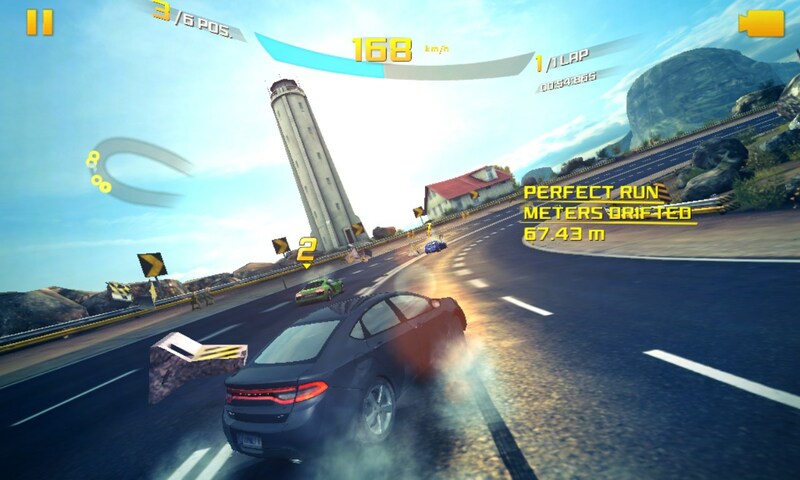 Asphalt 8: Airborne – Breathtaking sequel of legendary races. 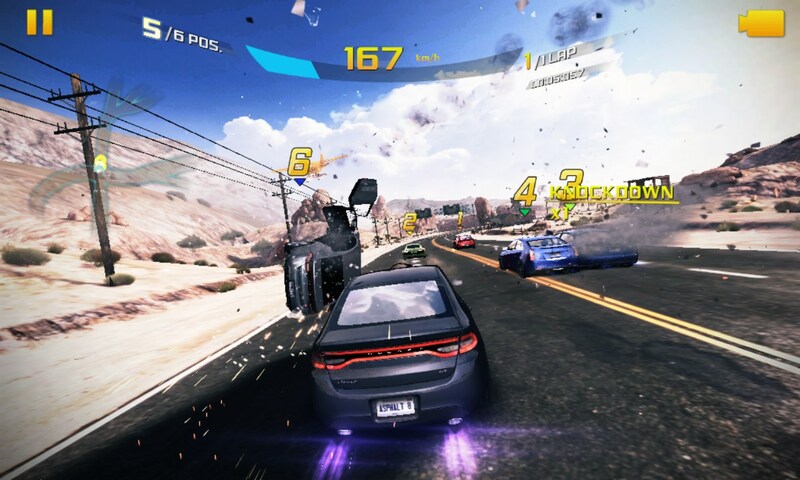 Asphalt 8: Airborne is a new part of the unrivaled races from the studio Gameloft where you will find more than one hundred and eighty breakneck races on eight corners of the world by forty-seven powerful vehicles. At that, 80% of these cars first appeared in the Asphalt series exactly. The game is based on a new, more productive graphics engine and you will notice it in the first seconds of a round. The graphics in this game are just awesome. Things worked out to the smallest details are not only cars taking part in races, but also those that you meet along the way. The game world is detailed just as clearly. This applies to the terrain, and to the trees growing along the roadsides, and to the flowing water. Even the dividing fences shatter to pieces when collided with any road users, and the vehicles lose in accidents the doors and other parts of the body. By the way, depending on the type of terrain or weather conditions, your car will being gradually covered by a layer of dust and dirt. The physics in the game have undergone minor changes as well and, of course, to the better. Now, just as in real life, while being in a controlled drift it isn't advisable to activate nitro or hit the brakes. If you dare to do so, you will feel the charm of the realistic physics and will simply be thrown into the oncoming lane or hit seriously by a curb. In this game, in addition to new tracks, cars and challenges, you will find new opportunities. Now, by using specially twisted jumps and ramps, you will be able to perform somersaults right in the air, and it does not matter if you fail to drive on the trampoline with all the four wheels. In this case, the car will also be thrown upward but it will behave respectively (you too will spin in the air but not the way you wanted it). Another feature of this version is an incredibly large variety of routes. The road will speckle with a huge number of intersections and alternative routes, because of which it is extremely difficult to make forecasts regarding victory. 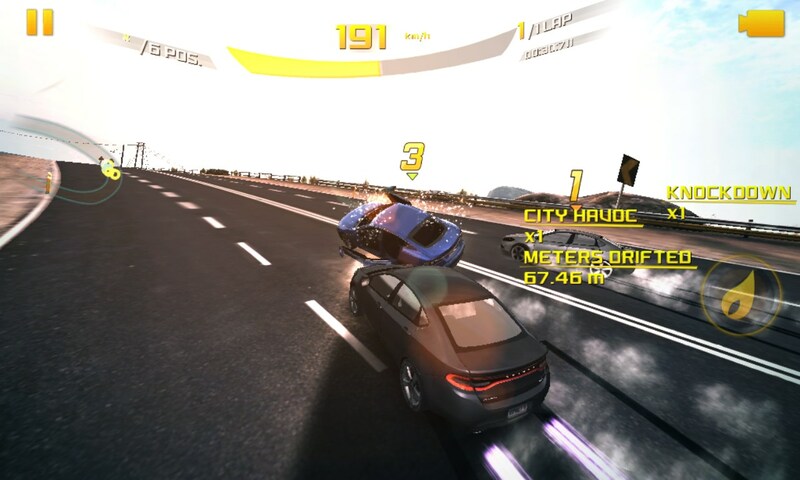 For example, on the second track laid in the heart of Japan, it is possible to break away from your rivals in a few seconds after the start, and if you look in the upper left corner of the screen, it will be clear that you are the undisputed leader, but after missing one important turn you will see just before the finish all your competitors will jump out from a small alley and leave you behind. In general, the game, as expected, provides a lot of interesting possibilities. It will delight you with the excellent design, incredibly high-quality graphics, the astounding gameplay and a holy load of adrenaline. We recommend it to all fans of the genre. Try reinstalling the app or deleting the cache in your app store. After the download it said to tap to open, so I did, and after about 7 seconds of blank screen, there was an error message and I was kicked back to the screen that said to tap to open. I tried tapping 2 more times and the same thing happens, and my phone doesn't have any sort of file manager to open it with. The only thing I see is the 800 something megabytes under the downloads section of storage sense, but opening the downloads only shows a delete button. How do I get the game to work? what device are you using? Don't you see an icon for the game after installing it? I don't see why not... are you having trouble with this? If you get a dialog with a tick box about downloading only over WiFi, read it carefully and tick or untick it as appropriate. I think so, are you having problems with it? can it be played offline??? 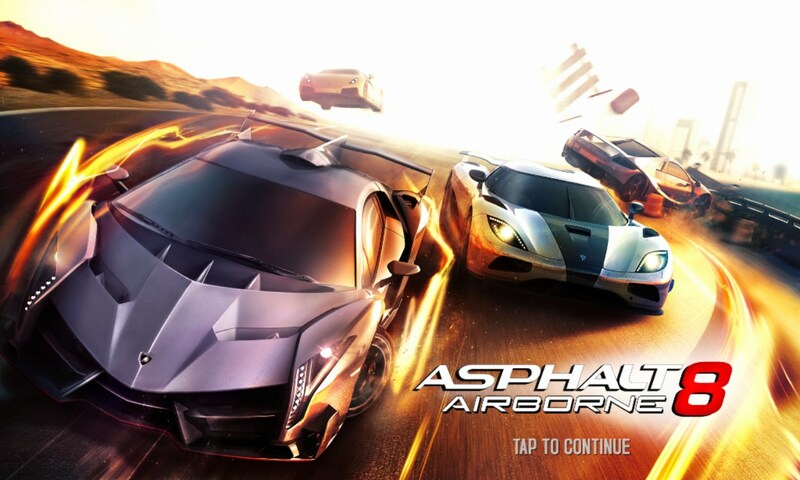 i have downloaded asphalt.xap from computer..and now how should i install it in my lumia phone? hi there, you need to download the xap on your phone. You could copy the short url up there into your phone's internet browser. Or you can install directly from your computer if you sign in to your microsoft account. Click "free version" instead of "download" to go through to the windows phone store, where you can log in and do this. cant i copy the xap file from computer into my phone? Hey there. Try uninstalling it, restarting your phone, and then reinstalling it. i install asphalt 8 and download 280 mb data. Here's what you should try: first uninstall the app and restart your device. Afterwards reinstall the app and it should function properly. Let me know if it works or if you require more assistance. It is possible that the overall size of the app may change as the developers add additional content. I am not sure what you meant by: "It is also not exceeding". If you mean that the app stops downloading, then please check that you have the necessary for the download to complete. If the issue persists then let me know and I will do my best to assist you, but please make sure to mention any error messages displayed along with a detailed description of the issue. Is there any link for additional file ? I am not sure about what could be causing this. Is any error message displayed when the app stops installing or does it simply stop without indicating why? It may be possible that the app + XAP file are too big, have you tried using a direct download from the App Store? What error message do you get when trying to install? Could this be due to a lack of memory? What happens when you attempt to launch the app? Please try to describe the issue with as much detail as possible and make sure to include any error messages that may be displayed. trhis game is incredible....am an fan of this game. What exactly is the issue that occurs when attempting to install the game on the device? Please make sure to include any error messages displayed. If you already have the app installed then you will need to go to the Windows Phone Store and update it. Is it demo version cz have seen PURCHASE FULL GAME in screen shot. I believe a few 1gb + a few hundred mb of available space is required, I'm afraid I do not know the exact size as it may vary from device to device. There's a problem with this company app contact your company's support person for help. I'M USING LUMIA 620 AND MY BROTHER USING LUMIA 1020. 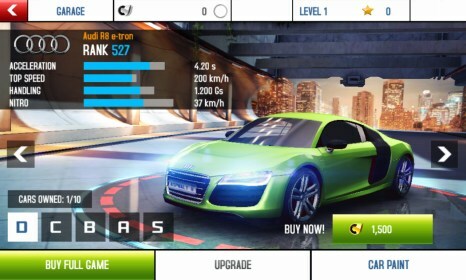 IT IS EXCELLENT RACING GAME WITH HIGH PERFORMANCE GRAPHICS.I'M WAITING FOR ASPHALT 9. Plz help me to install it i m having issue saying " this comp app is not being install plz contact the company store. I installed it in my lumia720......i ran well before update...now keeps crashing always....what to do?????? No, it won't run on Lumia 610. Not enough RAM. Plz helP me..........nokia 520 is good for us? Gta suPPort in nokia lumia 520? Install not finishing,why?? How to meke install?? Try checking whether there's enough free space on your device. What's exactly the name of the model you use? Not able to install in my lumia625..
Hey! Asphalt 8 is a really demanding game in terms of the graphics and I believe it won't launch on your phone. However, you can try downloading .apk file of the earliest release of the game and installing it manually. We hope it'd work out. when i tried to Install this App in my Lumia 625 using Xap Deployer its says "Can't Read Zip File"